This is my favorite go-to cookbook when I want to make something in the crockpot for an extended family Sunday dinner since there's so many recipes in one place. This is a compilation of the best recipes from the other five books in her "Fix-it and Forget-it" cookbook series, so you may not want to buy this if you already own the other titles. It's hard to pick favorites, but the "Blueberry-Apple Waffle Topping" is great on french toast and ice cream too! My chicken was fine in the "Low-fat Chicken Cacciatore" recipe. I also liked the "Chuck Wagon Beef" and "Our Favorite Chili" recipes. Do not use chicken recipes, they end up very dried out. It was fine. My wife liked it more than I did. It wouldn’t all fit in my crockpot, so I had to cook it in two batches. Finally, all in one handsome volume, the best 1400 slow-cooker recipes! Collected from some of America's best home cooks. Carefully selected from thousands of recipes. Eight small "galleries" of full-color photos of delectable slow-cooker dishes from the collection add sparkle throughout the cookbook. Phyllis Pellman Good's cookbooks have sold nearly 10 million copies. Her five beloved Fix-It and Forget-It cookbooks have themselves sold more than 8 million copies! Three of her cookbooks have been New York Times bestsellers. This is the perfect BIG COOKBOOK! Easy to understand, easy to use. Absolutely manageable for those who lack confidence in the kitchen. Convenient for those who are short on time. Will bring a "make-it-again" request from all who are lucky enough to enjoy these tasty dishes. 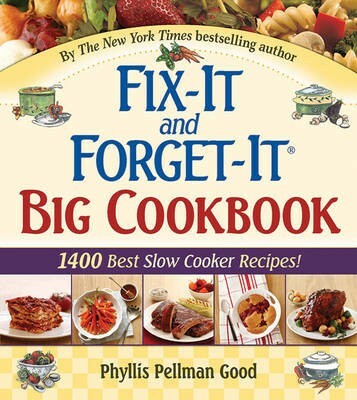 Fix-It and Forget-It BIG COOKBOOK, with its 1400 best slow-cooker recipes, is another winner!